A unique tangerine flavoured liqueur, Van Der Hum is produced in the Cape winelands of South Africa. A blend of five year old potstill brandy, wine distillate, tangerine peel, herbs and spices. The extracts are sweetened with glucose and cane sugar syrup. 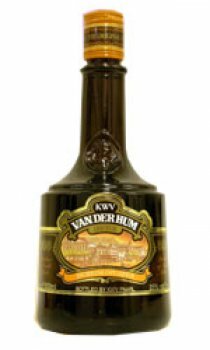 KWV Van Der Hum Liqueur has a complex citrus flavour enhanced by fragrant, mild spicy notes. Mellow and sweet with a lingering spicy aftertaste. KWV Van Der Hum Liqueur is a deep golden amber. When the first European settlement was established at the foot of Table Mountain by the Dutch East India Company in 1652 it was found the at the climate and soil were ideally suited to the cultivation of grapes. Soon the first wines were being produced and brandy distilled. One drink that found particular favour, also among the early mariners following the Cape Sea Route, was this distinctive master blenders liqueur. Van Der Hum means literally, "From Mr. H' m". Legend has it that several men laid claim to the origination of this remarkable liqueur that had so quickly brought fame to the Cape the world over. To avoid serious trouble it was agreed to share the honors by bestowing on the liqueur the name of the anonymous "From Mr. H' m".